This fall LWLA worked with the Tregaron Conservancy to seed a native meadow on the grounds of the historic Tregaron estate, one of the few remaining naturalistic landscapes designed by Ellen Shipman, a doyenne of American landscape architecture. The seeded meadow will replace large swathes of invasive exotic vegetation that had colonized the site during a long period of neglect in the latter half of the twentieth century. 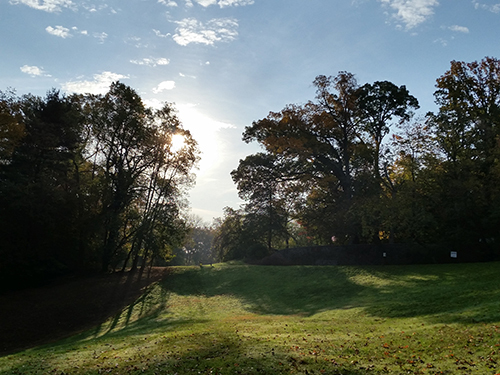 Our office has been involved in a number of historic landscape restoration projects, including at nearby Dumbarton Oaks Park. Such projects have the significant and distinct challenge of restoring intended aesthetic experiences while balancing ecosystem restoration and interpretation for contemporary audiences. We’re so pleased to be working on these historic grounds with the good folks at the Tregaron Conservancy, who have done a masterful job of overseeing the restoration of this piece of American landscape history. Click here to read an article by The Cultural Landscape Foundation about the Conservancy’s work.